ELVA-1 Company, the world expert in millimeter-wave communications, has announced 10 Gbps Point-to-Multipoint (PtMP) solution as cheaper alternative to FTTH (Fiber To The Home) technology. The solution consists of ELVA’s PPC-10G-E E-band 70/80 GHz long-distance radio and Point-to-Multipoint V-band 60 GHz Base Unit (BU). 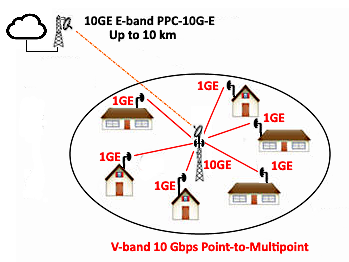 In this topology, PPC-10G-E radio is used to deliver 10GE throughput from carrier-grade backhaul to V-band 60 GHz Base Unit. The Base Unit establishes 1GE (1 Gbps) connectivity to a number of Terminal Units (TU) around of it. The BU has 10GE optical interface and TU has 1GE twisted pair connector. As leading industry solution, ELVA’s PtMP BU has 10 Gbps aggregate throughput at Base Unit and 1GE throughput at Terminal Units. The number of TUs connected to each BU could be as many as 10 TUs or even more. In case this number is more than 10 TUs, the 10 Gbps throughput from BU will be shared by these TUs proportionally. Although, as new 10 Gbps Point-to-Multipoint solution is primary intended to be alternative to FTTH, it is able to cover a wide range of modern applications. This includes true wireless Gigabit lines to households and small business premises, Safe City networks, 5G last mile, video surveillance, etc. Proven up to 1600ft (500m) range allows to build high-density PtMP networks at urban conditions. Consider high market demand for low cost wireless Gigabit lines to households, ELVA-1 has announced very affordable Terminal Unit price as low as $200 to $400 depending on TU specs and type of antennas. This topology allows to connect a multi-client site like small town, village, business campus, etc. to a nearest 10/40/100GE backhaul and establish FTTH-grade radio links to every client at low cost. Currently PPC-10G-E E-band radios are available in High Power version (PPC-10G-E-РЗ) for 6+ miles hop and in version PPC-10G-E-L2+ with L2+ switch on-board. Up to 3x V-band BUs can be connected to each PPC-10G-E-L2+ radio over its built-in L2+ switch. Founded in 1993, ELVA-1 is well known player at industrial and scientific instrumentation markets as supplier of components and systems for frequencies from 30 GHz to 1THz. Since 2000, ELVA-1 designs and manufactures ultra high speed radio links according to ECC and FCC requirements. The link operating frequencies include 40.5-43.5GHz, 71-76 & 81-86 GHz, and 92-95 GHz with emphasis on 71-76 & 81-86 GHz as FCC streamlined licensing rules for E-band. Similar, European regulations CEPT channel plan (ECC Recommendation (05)07) for 71-76GHz and 81-86GHz frequency bands radios opens EU wireless fronthaul, backhaul and network extension markets for point-to-point fixed wireless systems (FWS). ELVA-1 has contracted manufacturing facilities in St. Petersburg, Russia.